Mounting Kit allows two notebook drives to fit into a standard 3.5" drive bay of the PC case. Introduce new technology high-speed SSD (solid state drives) or make use of laptop HDD in your PC. ‣ Keyboard / Mouse. Rosewill RDRD-12001 - 2.5" or 3.5” HDD / SSD Drive Bracket For 5.25" Drive Bay, Black. 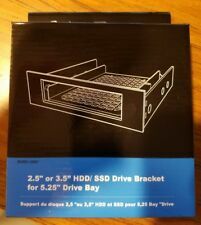 Fitting for 2.5" or 3.5" HDD / SSD into 5.25" Drive Bay. Fitting for 2.5" or 3.5" HDD / SSD into 5.25" drive bay. Mount the Drive Adapter to a 3.5” drive bay and secure with the included mounting screws. (UPC code removed due to promotion sale). Dual 2.5” SSD/HDD Mounting Kit for 3.5” PC Drive Bays. The RX-C200P will adapt two 2.5” Solid State or Hard Disk Drives into one 3.5” drive bay. 2 x 2.5" SSD / HDD compatible (up to 9.5 mm high). Mounting Kit allows two notebook drives to fit into a standard 3.5" drive bay of the PC case. Introduce new technology high-speed SSD (solid state drives) or make use of laptop HDD in your PC. Mount the Drive Adapter to a 3.5??. drive bay and secure with the included mounting screws. Dual 2.5 SSD/HDD Mounting Kit for 3.5 PC Drive Bays. The RX-C200P will adapt two 2.5 Solid State or Hard Disk Drives into one 3.5 drive bay. 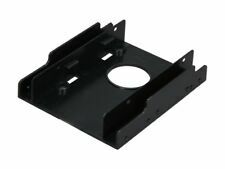 This Mounting Bracket allows a 2.5” SSD Drive and/or an HDD Drive to fit into a 3.5” PC Drive Bay. Rosewill RX-C200P 2.5" SSD / HDD. SSD or HDD into one 3.5” drive bay. Mounting Kit allows two notebook drives to fit into a standard 3.5" drive bay of the PC case. Introduce new technology high-speed SSD (solid state drives) or make use of laptop HDD in your PC. 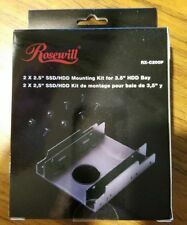 Rosewill 2.5Inch SSD / HDD Plastic Mounting Kit for 3.5Inch Drive Bay Components. Condition is New. Shipped with USPS First Class Package.